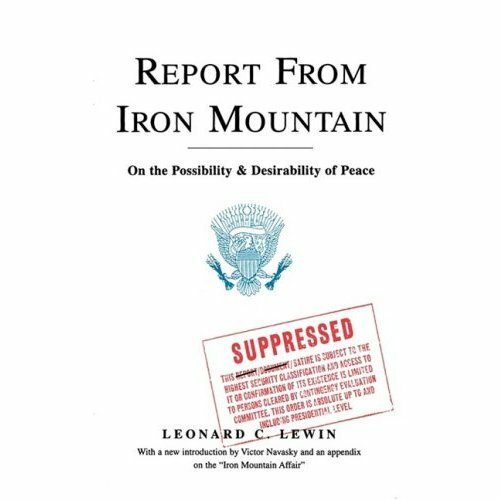 In his 1966 book, "How the World Really Works," Alan B. Jones included a chapter on the "Report from Iron Mountain: On the Possibility and Desirability of Peace," later published in 1967 by The Dial Press. It became a bestseller, then disappeared. Now few copies are available, but when circulating in the 1960s, it was reported that concerned Johnson administration officials ordered global US embassies to downplay it, saying it had nothing to do with policy. Later accounts doubted the material's authenticity, suggesting it was a hoax. True or false, its findings are reviewed below because they accurately reflect longstanding US policy. Prepared by unnamed 15-man "Special Study Group, (SSG)" they were commissioned "by some governmental entity which wished to remain unknown" because of the sensitive nature of its assignment, completed after two and a half years work, from August 1963 - March 1966, at a secret Iron Mountain, New York "underground nuclear hideout." First surfacing in 1961, the idea originated during the Kennedy administration, senior officials Robert McNamara, McGeorge Bundy, Dean Rusk, and others, knowing there was no serious plan for peace at a time the president wanted to end the Cold War. An SSG member only identified as "John Doe" revealed it. "to determine, accurately and realistically, the nature of the problems that would confront the United States if and when a condition of 'permanent peace' should arrive, and to draft a program for dealing with this contingency." The Report was suppressed, "both by the Special Study Group itself and by the government INTERAGENCY committee to which it had been submitted. After months of agonizing, Doe" decided to go public. Group members were carefully chosen for their physical and social sciences expertise, as well as their years of academic, government and/or business experience, qualifying them for their assignment. "responsibility to the society for which I am part supersedes any self-assumed obligation on the part of the fifteen individual men....What is needed now, and needed badly, is widespread public discussion and debate about the elements of war and the problems of peace." ● the notion that the "basic authority of a modern state over its people resides in its war powers;"
● policies to follow if it does. ● without war, "what other institutions exist or might be devised to fulfill these functions;"
● possible social system improvements from war-readiness. Wars are an economic, political and ecological necessity, important to continue indefinitely. Peace "would almost certainly not be in the best interest of (a) stable society" and might be "catastrophic." General disarmament would require "scrapping....a critical proportion of the most highly developed occupational specialties in the economy." No other control mechanism has been devised even close to it in effectiveness. War-making potential doesn't result from threats. In fact, "threats against the national interest are usually created or accelerated to meet the changing needs of the war system." Significant nonmilitary functions and benefits of wars were claimed to exist, including economic protections against depression, and stimulus contributing to the rise of gross national product and individual productivity. Nothing else devised "can remotely compare to it in effectiveness." It's the "essential economic stabilizer." War's political importance is crucial. It defines and enforces relations with other nations. National sovereignty and the traditional nation-state depend on it. The war system is essential to internal political stability. "Without it, no government has ever been able to obtain acquiescence (to) its legitimacy, or right to rule its society." Poverty is necessary and desirable, the same Orwellian social stability 1884 idea, about "keeping the Low's in poverty and the High's in power, forever." A modern, sophisticated form of slavery serves the same social control purpose. Government must optimize the number of warfare deaths, never letting a good opportunity go to waste. "Intensified environment pollution," including air and water is acceptable, and, without war, a comprehensive eugenics program and "universal test-tube procreation might have to substitute." SSG members rejected individual freedom, opting for subservience to a ruling elite, the system that governs world nations and America since inception, instituted by the Founders so the country's owners could run it, and wage wars to solidify control. "The permanent possibility of war is the foundation for stable government. It supplies the basis for general acceptance of political authority." It lets societies maintain class distinctions, and ensures the subordination of citizens to the state, run by elites with "residual war powers." As for policy measures in a world at peace, SSG members stated "as strongly as we can, that the war system cannot responsibly be allowed to disappear," absent a credible alternative to ensure social stability and societal control. Only then should transitional measures be considered. 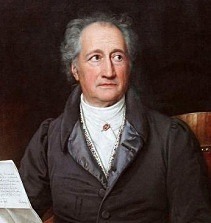 "Such solutions, if indeed they exist, will not be arrived at without a revolutionary revision of the modes of thought heretofore considered appropriate. Some observers....believe" the obstacles can't be overcome "in our time, that the price of peace is, simply, too high....It is uncertain....whether peace will ever be possible. It is far more questionable....that it would be desirable even if it were demonstrably attainable." Though repugnant to many, "The war system....has demonstrated its effectiveness since the beginning of recorded history." A viable peace alternative would constitute a giant leap "into the unknown" with its inevitable risks. Genuine peace will be destabilizing until proved otherwise. SSG recommendations included establishing a "permanent WAR/PEACE Research Agency" with unlimited funds to be used at its own discretion. It would be organized like the National Security Council "responsible solely to the President" or officials he designates - then operate secretly for two purposes. First, to determine, from what's known and can be learned, the statistical probability for an eventual peace. Second, to conduct "War Research" to ensure "the continuing viability of the war system" as long as it's believed necessary and/or desirable for society's stability and survival. 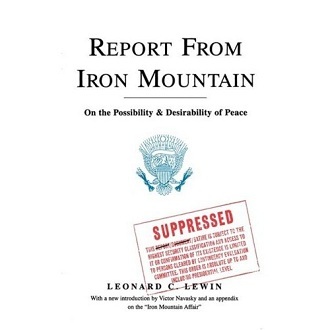 The Iron Mountain Report "has already created our present. It is now shaping our future," one single-mindedly for war to the detriment of all but imperial interests and profiteers that benefit handsomely. to The Lendman News Hour on RepublicBroadcasting.org Monday - Friday at 10AM US Central time for cutting-edge discussions with distinguished guests on world and national issues. All programs are archived for easy listening.